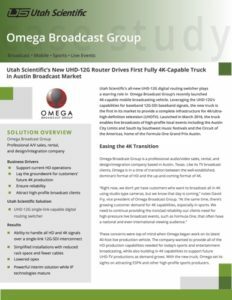 Utah Scientific products play a starring role in live events for applications such as sports broadcasting, mobile production trucks, music festivals, and airshows. We provide a complete infrastructure to enable live broadcasts of high-profile events. Our state-of-the-art signal routing systems handle the complexities of live event production with ease – including single-link 4K 12-Gb/s routing – and they do it in the most reliable, efficient, and cost effective manner. 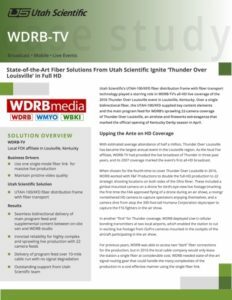 Utah Scientific’s UTAH-100/XFD fiber distribution frame with fiber transport technology played a starring role in WDRB-TV’s all-HD live coverage of the 2016 Thunder Over Louisville event in Louisville, Kentucky. Over a single bidirectional fiber, the UTAH-100/XFD supplied key content elements and the main program feed for WDRB’s sprawling 22-camera coverage of Thunder Over Louisville, an airshow and reworks extravaganza that marked the official opening of Kentucky Derby season in April.